[The subject matter of the present article has not been chosen from any desire of “finding fault” with the Christian religion, as LUCIFER is often accused of doing. No special animosity is felt towards popery any more than against any other existing dogmatic and ritualistic faith. We merely hold that “there is no higher religion than truth.” Hence, being incessantly attacked by the Christians – among whom none are so bitter and contemptuous as the Romanists – who call us “idolaters” and “heathens,” and otherwise denounce us, it is necessary that at times something should be said in our defence, and truth reestablished. Not so with the Roman Catholics, our pious detractors. The Papists worship them and have rendered to them divine homage from the beginning of Christianity to this day, and in the full acceptation of the italicised words, as this article will prove. Even for the Protestants, the Angels in general, if not the Seven Angels of the Stars particularly – are “Harbingers of the Most High” and “Ministering Spirits” to whose protection they appeal, and who have their distinct place in the Book of Common Prayer. The fact that the Star and Planetary Angels are worshipped by the Papists is not generally known. The cult had many vicissitudes. It was several times abolished, then again permitted. It is the short history of its growth, its last re-establishment and the recurrent efforts to proclaim this worship openly, of which a brief sketch is here attempted. This worship may be regarded for the last few years as obsolete, yet to this day it was never abolished. Therefore it will now be my pleasure to prove that if anyone deserves the name of “idolatrous,” it is not the Theosophists, Occultists, Kabalists and Astrologers, but, indeed, most of the Christians; those Roman Catholics, who, besides the Star-angels, worship a Kyriel of more or less problematical saints and the Virgin Mary, of whom their Church has made a regular goddess. In the middle of the VIIIth century of the Christian era the very notorious Archbishop Adalbert of Magdeburg, famous as few in the annals of magic, appeared before his judges. He was charged with, and ultimately convicted – by the second Council of Rome presided over by Pope Zacharia – of using during his performances of ceremonial magic the names of the “seven Spirits” – then at the height of their power in the Church – among others, that of URIEL, with the help of whom he had succeeded in producing his greatest phenomena. As can be easily shown, the church is not against magic proper, but only against those magicians who fail to conform to her methods and rules of evocation. However, as the wonders wrought by the Right Reverend Sorcerer were not of a character that would permit of their classification among “miracles by the grace, and to the glory of God,” they were declared unholy. Moreover, the Archangel URIEL (lux et ignis) having been compromised by such exhibitions, his name had to be discredited. But, as such a disgrace upon one of the “Thrones” and “Messengers of the Most High” would have reduced the number of these Jewish Saptarishis to only six, and thus have thrown into confusion the whole celestial hierarchy, a very clever and crafty subterfuge was resorted to. It was, however, neither new, nor has it proved very convincing or efficacious. It was declared that Bishop Adalbert’s Uriel, the “fire of God,” was not the Archangel mentioned in the second Book of Esdras; nor was he the glorious personage so often named in the magical books of Moses – especially in the 6th and 7th. The sphere or planet of this original Uriel was said, by Michael Glycas the Byzantine, to be the Sun. How then could this exalted being-the friend and companion of Adam in Eden before his fall, and, later, the chum of Seth and Enoch, as all pious Christians know-how could he ever have given a helping hand to sorcery? Never, never! the idea alone was absurd. Therefore, the Uriel so revered by the Fathers of the Church, remained as unassailable and as immaculate as ever. It was a devil of the same name – an obscure devil, one must think, since he is nowhere mentioned – who had to pay the penalty of Bishop Adalbert’s little transactions in black magic. This “bad” Uriel is, as a certain tonsured advocate has tried hard to insinuate, connected with a certain significant word of occult nature, used by and known only to Masons of a very high degree. Ignorant of the “word” itself, however, the defender has most gloriously failed to prove his version. Such whitewashing of the archangel’s character was of course necessary in view of the special worship paid to him. St. Ambrosius had chosen Uriel as a patron and paid him almost divine reverence.1 Again the famous Father Gastaldi, the Dominican monk, writer and Inquisitor, had proven in his curious work “On the Angels” (De Angelis) that the worship of the “Seven Spirits” by the Church had been and was legal in all the ages; and that it was necessary for the moral support and faith of the children of the (Roman) Church. In short that he who should neglect these gods was as bad as any “heathen” who did not. To show the great latitude offered to such subterfuges, the occult tenets about the celestial Hosts have only to be remembered. The world of Being begins with the Spiritual Fire (or Sun) and its seven “Flames” or Rays. These “Sons of Light,” called the “multiple” because, allegorically speaking they belong to, and lead a simultaneous existence in heaven and on earth, easily furnished a handle to the Church to hang her dual Uriel upon. Moreover, Devas, Dhyan-Chohans, Gods and Archangels are all identical and are made to change their Protean forms, names and positions, ad libitum. As the sidereal gods of the Sabians became the kabalistic and talmudistic angels of the Jews with their esoteric names unaltered, so they passed bag and baggage into the Christian Church as the archangels, exalted only in their office. These “Spirits” are called primarii principes. But what these first Principles are in reality is not explained. In the first centuries of Christianity the Church would not do so; and in this one she knows of them no more than her faithful lay sons do. She has lost the secret. Both Kabalists and “Heathen” must feel quite flattered to thus see their Devas and Rishis become the “Ministers Plenipotentiary” of the Christian God. And now the narrative may be continued unbroken. Until about the XVth century after the misadventure of Bishop Adalbert, the names of only the first three Archangels out of the seven stood in the Church in their full odour of sanctity. The other four remained ostracised – as names. Whoever has been in Rome must have visited the privileged temple of the Seven Spirits, especially built for them by Michael Angelo: the famous church known as “St. Mary of the Angels.” Its history is curious but very little known to the public that frequents it. It is worthy, however, of being recorded. In 1460, there appeared in Rome a great “Saint,” named Amadœus. He was a nobleman from Lusitania, who already in Portugal had become famous for his prophecies and beatific visions. 3 During one of such he had a revelation. The seven Archangels appeared to the holy man, so beloved by the Pope that Sixtus IV had actually permitted him to build on the site of St. Peter in Montorio a Franciscan monastery. And having appeared they revealed to him their genuine bona fide mystery names. The names used by the Church were substitutes, they said. So they were, and the “angels” spoke truthfully. Their business with Amadœus was a modest request. They demanded to be legally recognized under their legitimate patronymics, to receive public worship and have a temple of their own. Now the Church in her great wisdom had declined these names from the first, as being those of Chaldean gods, and had substituted for them astrological aliases. This then, could not be done, as “they were names of demons” explains Baronius. But so were the “substitutes” in Chaldea before they were altered for a purpose in the Hebrew Angelology. And if they are names of demons,asks pertinently de Mirville, “why are they yet given to Christians and Roman Catholics at baptism?” The truth is that if the last four enumerated are demon-names, so must be those of Michael, Gabriel and Raphael. But the “holy” visitors were a match for the Church in obstinacy. At the same hour that Amadœus had his vision at Rome, in Sicily, at Palermo, another wonder was taking place. A miraculously-painted picture of the Seven Spirits, was as miraculously exhumed from under the ruins of an old chapel. On the painting the same seven mystery names that were being revealed at that hour to Amadoeus were also found inscribed “under the portrait of each angel,” 4 says the chronicler. Whatever might be in this our age of unbelief the feelings of the great and learned leaders of various psychic and telepathic societies on this subject, Pope Sixtus IV was greatly impressed by the coincidence. He believed in Amadœus as implicitly as Mr. Brudenel believed in the Abyssinian prophet, “Herr Paulus.” 5 But this was by no means the only “coincidence” of the day. The Holy Roman and Apostolic Church was built on such miracles, and continues to stand on them now as on the rock of Truth; for God has ever sent to her timely miracles. 6 Therefore, when also, on that very same day, an old prophecy written in very archaic Latin, and referring to both the find and the revelation was discovered at Pisa – it produced quite a commotion among the faithful. The prophecy foretold, you see, the revival of the “Planetary-Angel” worship for that period. Also that during the reign of Pope Clement VII, the convent of St. François de Paul would be raised on the emplacement of the little ruined chapel. “The event occurred as predicted,” boasts de Mirville, forgetting that the Church had made the prediction true herself, by following the command implied in it. Yet this is called a “prophecy” to this day. But as it appears from sundry documents, all did not go quite as smooth as the “blessed spirits” would have liked, and the poor Duca had a hard time of it. Notwithstanding the strong protection of the Colonna families who used all their influence with Pope Paul III, and the personal request of Marguerite of Austria, the daughter of Charles Vth, “the seven spirits” could not be satisfied, for the same mysterious (and to us very clear) reasons, though propitiated and otherwise honoured in every way. The difficult mission of Duca, in fact, was crowned with success only thirty-four years later. Ten years before, however, namely in 1551, the preparatory purification of the Thermæ had been ordered by Pope Julius III, and a first church had been built under the name of “St. Mary of the Angels.” But the “Blessed Thrones,” feeling displeased with its name, brought on a war during which this temple was plundered and destroyed, as if instead of glorified Archangels they had been maleficent kabalistic Spooks. But there was the same difficulty as before. The Popes had pronounced the original titles demon-names, i.e., those of Pagan gods, and to introduce them into the church service would have been fatal. The “mystery names” of the seven angels could not be given. True enough, when the old “miraculous” picture with the seven names on it had been found, these names had been freely used in the church services. But, at the period of the Renaissance, Pope Clement XI had ordered a special report to be made on them as they stood on the picture. It was a famous astronomer of that day, a Jesuit, named Joseph Biancini, who was entrusted with this delicate mission. The result to which the inquest led, was as unexpected as it was fatal to the worshippers of the seven Sabian gods; the Pope, while commanding that the picture should be preserved, ordered the seven angelic names to be carefully rubbed out. And “though these names are traditional,” and “although they have naught to do with,” and are “very different from the names used by Adalbert” (the Bishop-magician of Magdeburg), as the chronicler cunningly adds, yet even their mention was forbidden in the holy churches of Rome. Thus affairs went on from 1527 till 1561; the Rector trying to satisfy the orders of his seven “guides,” – the church fearing to adopt even the Chaldean substitutes for the “mystery-names” as they had been so “desecrated by magical practices.” We are not told, however, why the mystery-names, far less known than their substitutes have ever been, should not have been given out if the blessed “Thrones” enjoyed the smallest confidence. But, it must have been “small” indeed, since one finds the “Seven Archangels” demanding their restitution for 34 years, and refusing positively to be called by any other name, and the church still deaf to their desires. The Occultists do not conceal the reason why they have ceased to use them: they are dangerously magical. But why should the Church fear them? Have not the Apostles, and Peter pre-eminently, been told “whatsoever ye bind on earth shall be bound in Heaven,” and were they not given power over every demon known and unknown? Nevertheless, some of the mystery names may be still found along with their substitutes in old Roman missals printed in 1563. There is one in the Barberini library with the whole mass-service in it, and the forbidden truly Sabian names of the seven “great gods” flashing out ominously hither and thither. “Then Michael Angelo was summoned in all haste by Paul IV to the Vatican.” His magnificent plan was accepted and the building of the former church begun. Its construction lasted over three years. In the archives of this now celebrated edifice, one can read that: “the narrative of the miracles that occurred during that period could not be undertaken, as it was one incessant miracle of three years’ duration.” In the presence of all his cardinals, Pope Paul lV ordered that the seven names, as originally written on the picture, should be restored, and inscribed around the large copy from it that surmounts to this day the high altar. Duca was the first person buried in the church for the erection of which he had fought the best part of his life and finally procured for his heavenly patrons. On his tomb the summary of the revelations obtained by him, as also the catalogue of the prayers and invocations, of the penances and fasts used as means of getting the “blessed” revelations and more frequent visits from the “Seven” – are engraved. In the vestry a sight of the documents attesting to, and enumerating some of the phenomena of “the incessant miracle of three years’ duration” may be obtained for a small fee. The record of the “miracles” bears the imprimatur of a Pope and several Cardinals, but it still lacks that of the Society for Psychic Research. The “Seven Angels” must be needing the latter badly, as without it their triumph will never be complete. Let us hope that the learned Spookical Researchers will send their “smart boy” to Rome at an early day, and that the “blessed ones” may find at Cambridge – a Duca. But what became of the “mystery names” so cautiously used and what of the new ones? First of all came the substitution of the name of Eudiel for one of the Kabalistic names. Just one hundred years later, all the seven names suddenly disappeared, by order of the Cardinal Albitius. In the old and venerable Church of Santa Maria della Pieta on the Piazza Colonna, the “miraculous” painting of the Seven Archangels may be still seen, but the names have been scratched out and the places repainted. Sic transit gloria. A little while after that the mass and vesper services of the “Seven” were once more eliminated from the missals used, notwithstanding that “they are quite distinct” from those of the “planetary Spirits” who used to help Bishop Adalbert. But as “the robe does not really make the monk,” so the change of names cannot prevent the individuals that had them from being the same as they were before. They are still worshipped and this is all that my article aims to prove. The same “holy Pope permitted moreover to the nuns of Matritensis to establish the fête of JEHUDIEL the patron of their convent.” Whether another less pagan name has now been substituted it we are not informed – nor does it in the least matter. In 1832 the same demand in a petition to spread the worship of the “Seven Spirits of God,” was reiterated, endorsed this time by eighty-seven bishops and thousands of officials with high-sounding names in the Church of Rome. Again, in 1858, Cardinal Patrizzi and King Ferdinand II in the name of all the people of Italy reiterated their petition; and again, finally, in 1862. Thus, the Church services in honour of the seven “Spirit-Stars” have never been abrogated since 1825. To this day they are in full vigour in Palermo, in Spain, and even in Rome at “St. 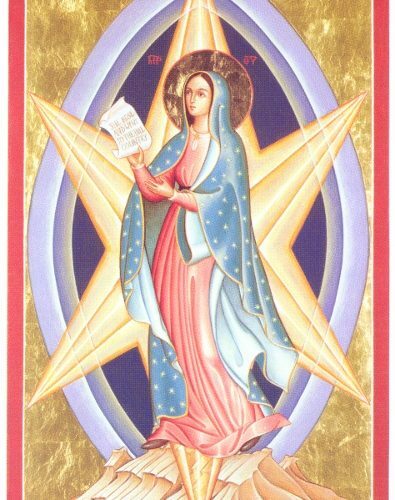 Mary of the Angels” and the “Gésu” – though entirely suppressed everywhere else; all this “because of Adalbert’s heresy,”de Mirville and the other supporters of Star-Angel worship are pleased to say. In reality there is no reason but the one already disclosed for it. Even the seven substitutes, especially the last four, have been too openly connected with black magic and astrology. And why not, since (St.) George is to this day, “the patron Saint of not only Holy Russia, Protestant Germany, fairy Venice, but also of merry England, whose soldiers,” – says W. M. Braithwaite, 10 – “would uphold his prestige with their heart’s blood.” And surely our “Seven gods” cannot be worse than was the rascally George of Cappadocia during his lifetime! The “seven principal planets” is another confession to the acceptance of a purely occult tenet. Every planet according to the esoteric doctrine is in its composition a Septenary like man, in its principles. That is to say, the visible planet is the physical body of the sidereal being the Atma or Spirit of which is the Angel, or Rishi, or Dhyan-Chohan, or Deva, or whatever we call it. This belief as the occultists will see (read in Esoteric Buddhism about the constitution of the planets) is thoroughly occult. It is a tenet of the Secret Doctrine – minus its idolatrous element – pure and simple. As taught in the Church and her rituals, however, and especially, as practised, it is ASTROLATRY as pure and as simple. There is no need to show here the difference between teaching, or theory, and practice in the holy Roman Catholic Church. The words “Jesuit” and “Jesuitism” cover the whole ground. The Spirit of Truth has departed ages ago – if it has ever been near it – from the Church of Rome. At this, the Protestant Church, so full of brotherly spirit and love for her sister Church, will say, Amen. The Dissenter, whose heart is as full of the love of Jesus as of hatred towards Ritualism and its mother Popery, will chuckle. If the Protestants do not recognize the “Seven Angels,” nor, while refusing them divine worship, do they feel ashamed and afraid of their names, as the Roman Catholics do, on the other hand they are guilty of “Jesuitism” of another kind, just as bad. For, while professing to believe the Scriptures a direct Revelation from God, not one sentence of which should be altered under the penalty of eternal damnation, they yet tremble and cower before the discoveries of science, and try to pander to their great enemy. Geology, Anthropology, Ethnology and Astronomy, are to them what Uriel, Scaltiel, Jehudiel and Barachiel are to the Roman Catholic Church. It is six of one and half a dozen of the other. And since neither one nor the other of the two religions will abstain from anathematizing, slandering and persecuting Magic, Occultism, and even Theosophy, it is but just and proper that in their turn the Students of the Sacred Science of old should retort at last, and keep on telling the truth fearlessly to the faces of both. 1 De Fide ad gratiam.Book III. 2 He who knows anything of the Purânas and their allegories, knows that the Rishis therein as well as the Manus are Sons of God, of Brahmâ, and themselves gods; that they become men and then, as Saptarishi, they turn into stars and constellations. Finally that they are first 7, then 10, then 14, and finally 21. The occult meaning is evident . 3 He died at Rome in 1482. 4 Des Esprits. &c., par de Mirville. 5 “Herr Paulus” – the no less miraculous production of Mr. Walter Besant’s rather muddled and very one-sided fancy. 7 But they had proved their power earlier by sending the war, the destruction of the church. and finally the epidemic; and this does not look very angelic – to an Occultist. 8 This is quoted from the volumes of the Marquis de Mirville’s “Pneumatologie des Esprits,” Vol. 11, p. 388. A more rabid papist and ultramontane having never existed, his testimony can hardly be suspected. He seems to glory in this idolatry and is loud in demanding its public and universal restoration. 9 p. 358 ibid. Vide infra. 10 “St. George for Merry England,” by W. M. Braithwaite. Masonic Monthly, No. 2. 11 These “principal planets” are the mystery planets of the pagan Initiates, but travestied by dogma and priestcraft. <12 Pneumatologie des Esprits,Vol. II. Memoire adressé aux Academies, p. 359et. seq.